Imprint: Price includes a FREE 4-color process imprint! Dark imprints are recommended when using a Stock Background. Some restrictions may apply. 4-color process allows you to print as many different colors as you want for one price! All PMS colors will be converted to the closest 4-color process match. A perfect match cannot be guaranteed. If providing your own background artwork, we recommend that the artwork bleed on all sides. Click here for standard imprint colors. 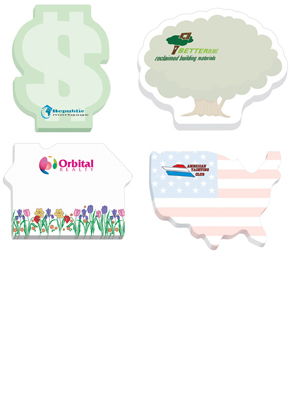 For imprint areas, more FREE Stock Background choices, and art specifications, visit www.bicgraphic.com and click on BIC Sticky Note.